C'est vrai, pourquoi on a pas ca chez nous ? Et quand je pense que ce grand classique de Tim Burton :"L'étrange Noel de Mr Jack" ressort en 3D,vu qu'ils vont les mettre dans les salles Gaumont du Disney Village j'attend toujours notre Phantom Manor Holliday . C'est un peu flippant la partie sur le haunted hotel sur le site off. Ca fait pas du tout Haunted Mansion mais bel et bien TOT! Justement je cite "Si Hong-Kong Disneyland ne dispose pas de sa propre Haunted Mansion (pas plus que d'un Phantom Manor), des efforts ont cependant...."
Pourqoi on a pas toute c'est choses-là à notre Disneyland ? Pourquoi on a toujours pas notre Phantom Manor Holiday ? D'autant plus qu'il va bientôt y avoir "L'étange Noel de Mr Jack" en 3d dans les salles Gaumont du Disneyvillage. Et bien parce qu'à DLRP on préfère défigurer Main Street, U.S.A. et Frontierland à coup de décorations cheap de supermarché ou de pompe géante à peinture orange ! Par contre tout n'est pas du meilleur goût dans cet Halloween... les bonbons en forme de doigt, c'est plus que limite ! Concernant les "bonbons doigts", faut savoir qu'en Chine il existe dans le commerce plein de bonbons, de pâtisseries et aussi de viandes en forme de morceau de corps d'Etre-Humain (doigts, cerveaux, coeur, intestin, bras, yeux,...). C'est très à la mode là-bas ! Ce n'est donc pas de mauvais goût mais plutôt culturel ! Un jour viendra où on trouvera la même chose en France, les gamins adoreront, j'en suis persuadé ! Quelqu'un aurait une vidéo sur l'intérieur du Main Street Haunted Hotel ? Parce que tout ce que j'en vois a l'air très très bien mais je me demande si au final ça ressemble vraiment aux pubs, surtout que c'est un truc temporaire. On Main Street, U.S.A. gates leading to the remains of a building built over 100 years ago have been discovered. No one knows the whole story of the hotel, but it rumored to having once been a very grand establishment but is now reputed to be haunted. People whisper strange stories about the hotel's original owner, James and his reclusive wife, Victoria. James' father was an unorthodox doctor who lost his medical license for performing controversial medical experiments. Some say that James continued his father's work on these bizarre life-saving inventions in the hotel's basement. Records recently uncovered show that many guests checked into the hotel and never checked out. The hotel staff tried to locate the missing guest and were also never heard from again. The most famous disappearance was that of a newlywed couple honeymooning at the hotel. Police records detail an emergency telegram shortly after the couple checked into the hotel. It read "help! Someone come get us quickly. Before we...". This was the last reported sighting or communication received from the newlyweds. No further details are known about their disappearance. Curious explorers reported finding some strange rooms within the hotel. The most notable finding is of a carefully concealed passageway which leads to the basement. The basement was said to be dimly lit and completely empty - except for a mysterious machine of unknown origine and purpose. Although the Hotel has not been re-opened for business, the gates are not longer locked to the public. Rumors of frightening sounds, strange happening, horrifying hauntings and uneplained disappearances continue to be documented. If you are brave enough to investigate further we warn you to enter at your own discretion. Merci pour ce lien Dash !!! Géniallisime!tout est calculé, donc cela pose pas de probleme^^ mais ca va cogiter pour se decider à y aller^^.Ca donne vraiment envie de découvrir tout cela,ca y va fort! Nouveau à HKDL pour cet Halloween 200, la Demon Jungle à Adventureland. Des chercheurs de trésor ont établi leur camp sur une terres sacrée, et ont mis en furie les démons du lieu! Les visiteurs devront déployer tous leurs pouvoirs pour s'échapper et trouver la sortie! (HONG KONG, August 26, 2008) - Beginning September 26, 2008, for 37 heart-pounding and haunting days until November 1, 2008, an expanded and intensified dark force will rule over the Resort during the Haunted Halloween at Hong Kong Disneyland. The Darkness will return stronger than ever, extending its reach into Adventureland, daring adrenaline junkies, scare fanatics and the curious to step into this uncharted territory. This never-before-seen frightful experience will come to life at Hong Kong Disneyland this Halloween season. The Darkness of the Haunted Halloween will take over even more of Hong Kong Disneyland this year. 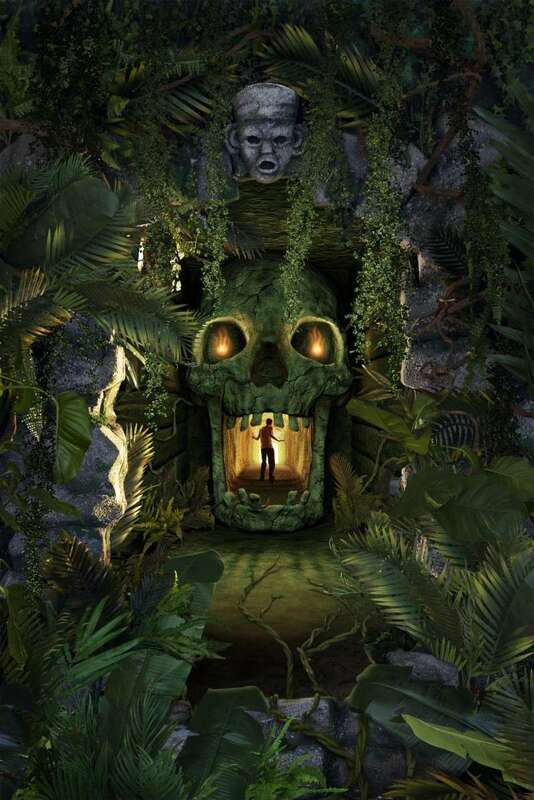 With the dark forces expanding their domain into Adventureland, Guests will encounter the recently discovered Demon Jungle. Treasure seeking, tomb raiding explorers made their camp on a sacred burial ground enraging the demons below, who are now seeking vengeance on all those who enter. Guests will need all their willpower to escape, and finding the exit will definitely be a challenge. This terrifying experience is specially designed for Hong Kong Disneyland! If Guests are lucky enough to escape, they will face another unexpected challenge on the Adventureland Haunted Trail. A Halloween-themed photo hot spot by day, it will be transformed into a mist shrouded trail on Friday and Saturday nights, inhabited with creatures such as Zombies, Gatekeepers and Pirates, as well as grinning Pumpkin Men that will have Guests jumping with fright. Back by popular demand, the Resort's exclusive Glow in the Park Halloween Parade will feature more spectacular UV lighting effects as it glows in the dark, creating engaging experiences and spectacular effects. Jack Skellington as the Pumpkin King, Dr. Finklestein together with Sally from The Nightmare Before Christmas, Disney's Villains, zombies and acrobatic Red Devils are all part of the scare. Watch out for the rousing finale as the Ghost Pirate Ship makes its premiere in this year's parade! The Main Street Haunted Hotel will reopen this year. The ghost of Victoria Maxwell will be up to her ultra scary antics at the hotel; there will be new spine tingling scares as she welcomes new and returning victims. Even Guests who escaped last year are welcome to check-in, but will they manage to check-out...? More traces of darkness will be found at Tomorrowland as Space Mountain is transformed into Space Mountain - Ghost Galaxy. Get lost in the terror of a frightening soundtrack and the hair-raising visual effects, with scary apparitions and ghoulish monstrosities around every treacherous bend. The immersive experience begins the moment Guests enter the Resort with all-new spooky décor including Pumpkin King Jack Skellington and Sally greeting Guests from the Main Gates. In addition, there are 160 all-new merchandise items as well as Halloween themed menus and drinks. "The Haunted Halloween at Hong Kong Disneyland was an overwhelming success last year and it was only through the Disney Difference that Guests were able to experience a totally immersive and interactive Halloween event," said Maple Lee, Vice President, Marketing of Hong Kong Disneyland. "According to statistics from Guest surveys, satisfaction levels during the Haunted Halloween 2007 reached 90%! This year, we have created an even more frightening and extensive Halloween experience." With young adults in mind, the Resort will once again launch a limited time Halloween evening ticket for Fridays and Saturdays. Designed for entry after 6:30pm (the Park will remain open on these days until 11:00pm), night goers can experience the intensely dark Haunted Halloween at its peak. Evening tickets will cost HK$198 for all age categories. "Last year, the majority of Guests visiting the Haunted Halloween at Hong Kong Disneyland were aged between 18 and 24. We are confident that our evening ticket will once again offer a flexible option to our young adult Guests this year." 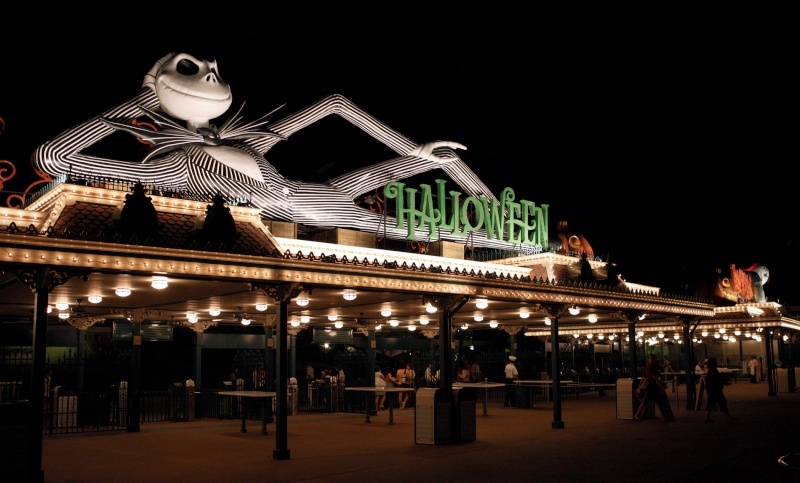 Beginning August 27, 2008, day tickets and evening tickets for the Haunted Halloween at Hong Kong Disneyland can be purchased at the Main Gate of the Park, through the Resort's website, at the Hong Kong Disneyland Ticket Express at MTR Hong Kong Station as well as at select Circle K outlets. A special ticket booth located at the Peak will also be opened on September 3, 2008. For more information about the Haunted Halloween at Hong Kong Disneyland, please logon to our website. Vous pouvez retrouver le communiqué de Presse ainsi que des photos sur Disney and More. Et ben on peut dire qu'ils aiment se faire peur! Elle a de la gueule cette affiche, la vache !!! La saison Halloween à HKD a commencée, et sur Disney and more vous pouvez retrouver une série de photos haute-res de l'évènement! ci-dessous l'une d'entre elle : regardez cet incroyable Jack skellington géant au-dessus de l'entrée du parc , on aimerait bien en avoir un comme ça à DLP, non ? c'est vrai que ça en jette. C'est marrant car ils ont récupérés les costumes du Manoir Hanté et les 999 Fantômes. Ca c'est un Halloween qui donne envie, à mi-chemin entre le Halloween classique à la Disney et les Halloween Horror Nights d'Universal studios! Autre chose que la vilaine masquarade au rabai qu'on nous sert à Paris depuis des années! Il faut bien qu'ils aient une chose qui soit mieux qu'ailleurs. J'adore (ironie - bien qu'à part le petit détail qui tue le reste soit pas mal du tout) ce montage : http://3.bp.blogspot.com/_OO7WbmARD08/SOFwQPIrO0I/AAAAAAAAIXo/4ixWApbobl8/s1600-h/Dark+Force_Horizontal_small_5101.jpg. >> Ils auraient au moins pu photoshooper les toits backstage de part et d'autre du Château, ça aurait permit de donner un coté plus crédible au montage... dommage. Sinon le Jack Skellington géant de l'entrée en jète un max et les têtes dans les arbres sur Main Street aussi, ils ont centré la déco sur ce film ce qui est pas si mal, et trop peu mis en valeur à DLRP. Un bon point pour HKDL, l'un des rares comme le souligne Mr. Freddy. C'est un peu facile de critiquer, mais les décos d'Halloween chez nous ne sont pas si vieilles (si, si, 2003: il y a 5 ans...) et NOel a été entièrement refait en 2005 avec les lampadaires et les illuminations du chateau. Sinon, c'est clair qu'ils font beaucoup d'efforts sur halloween, mais le reste ? Tu parles de Noel, mais ils n'ont strictement pas de parade spécifique pour cette saison (ils customisent simplement leur parade) et ils n'ont pas de parade nocturne (contrairement à Paris).